Silver Sports (India) Pvt. Ltd. a professional Racket manufacturer was established in 1965. Our main products include Badminton Rackets, Tennis Rackets, Squash Rackets and Shuttlecocks. With God's Grace, Quality Conciousness, Efficient Employees, Skilled Labour, the trust with Support of Our Customers and above all Valuable Consumers, We are the leading Manufacturers and Exporters of Badminton, Tennis, Squash Rackets and Shuttlecocks in India. We focus on making technologically advanced products for the continuous growth of the company, its performance and Excellence in Quality with competitive prices. All the products of our company are under strict production, so the quality and cost are controlled to the requirement of our clients. With extensive experience and improvement in Technology, we are capable of providing more creative designs of rackets to our clients. We at Silver Sports are commited to Attain, Deliver, and Maintain the Highest Standards of quality in our Works, Services and Supplies so as, to achieve Maximum Possible Customer Satisfaction. 1. 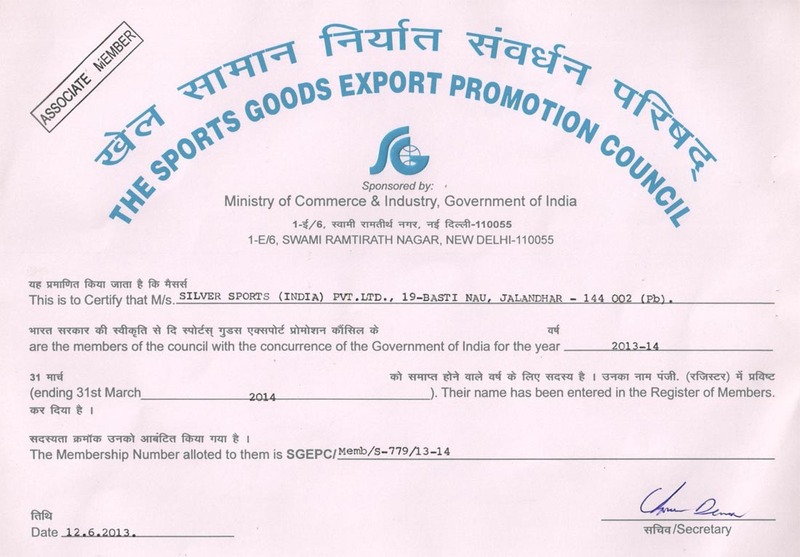 The Sports Goods Export Promotion Council, Delhi. 2. Association of Indian Sports Goods Industries(Regd.) Jalandhar. 3. All India Sports Goods Manufacturers Federation(Regd. ), Meerut. 4. Sports Goods Manufacturers & Exporters Association, Jalandhar. Copyright 2013 Silver Sports (India) Pvt Ltd. All rights reverved.